Acumatica customers and partners can look forward to Acumatica Summit 2019 continuing our yearly trend of supplying a full slate of comprehensive cloud ERP training. However, there is an update: we have a new training format. Don’t worry, we think you’ll like it. Here at Acumatica, we’re constantly improving our cloud ERP software. This is because we want to provide our customers who use it and our partners who sell it with the very best cloud ERP solution possible. We also strive to make our annual Summit better every year. And a major part of our improvement efforts stem from the feedback we receive from you, our customers and partners. After last year’s annual Summit, you said the training track sessions (which you considered extremely insightful) and the training track format could be made even better to meet the needs of certain members of the Acumatica community. We listened, and we made some updates. Our new training format will be introduced at Acumatica Summit 2019, coming January 27-February 1, 2019 in Houston, Texas. In years past, the training track sessions—which happen the Wednesday, Thursday, and Friday of every event—have mainly focused on ERP implementations. The instructors taught our implementation consultants how to implement Acumatica cloud ERP with customers’ specific business processes in mind. While this is important, they were more technical in nature and didn’t offer as many practical real-world scenarios. To make the trainings even better, we created a new, more flexible schedule—a mix-and-match format, if you will. It allows attendees to personalize their training agendas for their specific needs. The new training classes are open to all current and prospective customers, partners, sales, and pre-sale attendees; anyone can join any class. Like choosing your meal from a restaurant menu, you’ll be able to review and then choose the classes you need and/or want based on the topic and on the level of expertise you bring to the table. The classes will be designated as Basic or Intermediate. Instead of having one class for two-and-a-half days, you can take five classes with each one lasting a half day. The cost is the same. And you don’t have to stay with all Basic or all Intermediate classes. You can mix and match. For instance, you can attend Financial Basic in the morning and Inventory Replenishment in the afternoon. The next day, you might sign up for Field Services Basic or perhaps Generic Inquiries Intermediate. It’s your choice based on your needs. The half-day sessions will focus more on real-world scenarios and how Acumatica’s cloud ERP software can be utilized, not on how to configure it. While getting detailed information on ERP implementations and ERP implementation life cycles is what some Acumatica Summit 2019 attendees want, others want to focus on how to use the cloud ERP solution fully. We’re excited for you to experience this new training format. You now have the power to choose the courses you need most. If you check out the training track agenda, you’ll learn what’s covered in the session, who should attend, the dates and times, the instructor, prerequisites, and the Continuing Professional Education credit information. Again, they are all half-day sessions, and you have the option of choosing the ones most suited to your needs and level of expertise. One other important note: we will still be offering the one class over two-and-a-half-day options for vertical editions (e.g. 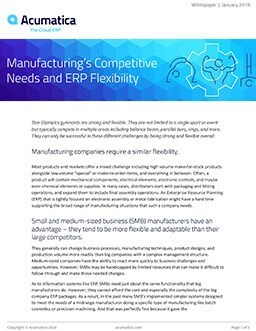 Commerce and Manufacturing) as well as for sales and pre-sales, which will focus on how to introduce and present Acumatica cloud ERP to prospective customers. From keynote sessions highlighting future product roadmaps and live demonstrations to breakout sessions geared specifically for customers, marketing, partners, developers and sales, Acumatica Summit 2019 promises to be the cloud ERP event of the year. And now, with our new training format, you’ll be able to personalize your training agenda, which will help you accelerate your success with Acumatica’s true cloud ERP solution. Do you have questions about the new training format or Acumatica’s cloud ERP software? Contact our team; they’ll be happy to answer them. Alexandra is Acumatica’s Technical Documentation Team Lead. She has more than 10 years of technical communications experience. Alexandra joined Acumatica in 2013 has built a strong team of technical writers, designed a documentation style, contributed to replacing legacy materials, delivered release notes, verified UI strings, and established a process for tracking application changes. Recently, the documentation and training teams have been merged in Acumatica Education, and Alexandra is overseeing this team.